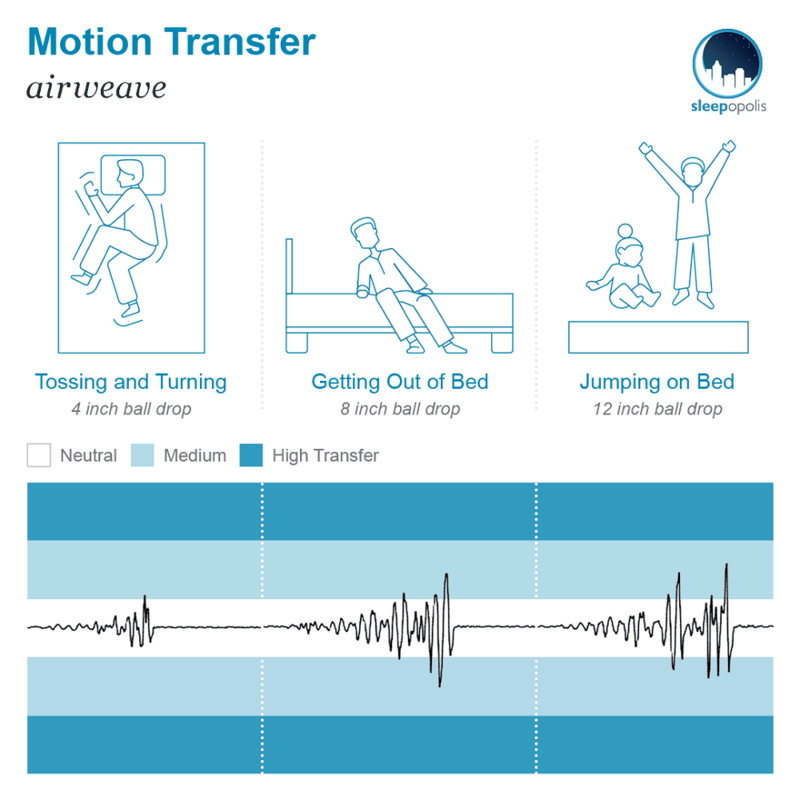 Airweave Mattress - Unique Material Provides Better Sleep? Specifically designed to synchronize the body with airflow, the airweave features a unique all-plastic, interwoven construction that’s become a favorite among high-performance athletes and artists around the world. 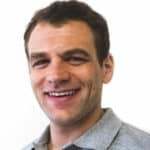 Given its partnerships with some of the world’s most illustrious sporting bodies (including the U.S. Ski & Snowboard Team as well as the Royal Ballet School), I can’t wait to give this bed a whirl! But before I get too excited, I’ve got to put it through my series of rigorous tests to figure out how comfortable it actually is and whether or not it could be the perfect mattress for you! 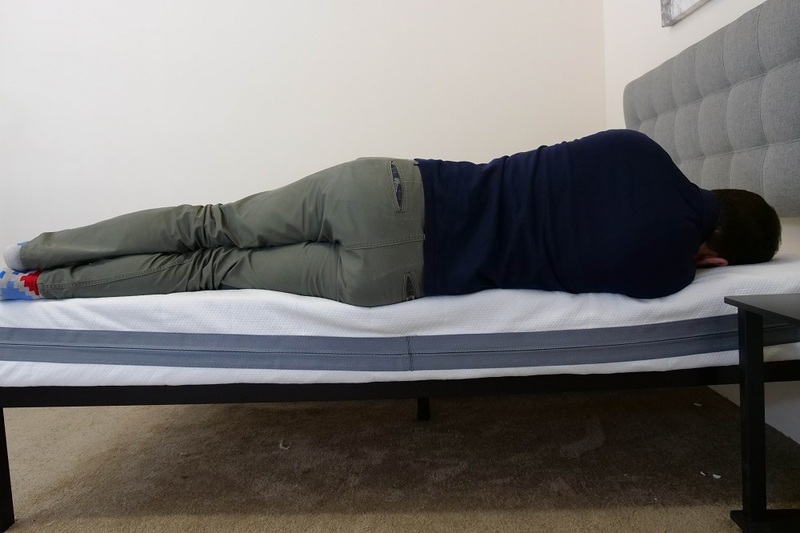 Continue reading below for my full review of the airweave mattress. Don’t have time to read it all? Click here to skip to the bottom and check out my review summary. The Airweave is great at regulating temperature, so would be a nice choice for sleepers who tend to overheat at night! 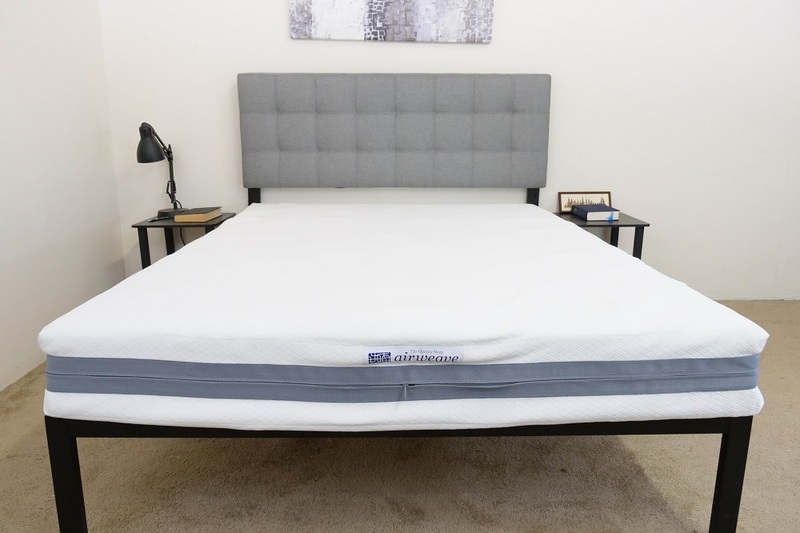 Compared to other mattresses I’ve reviewed, the airweave truly has a one-of-a-kind construction built solely from the brand’s proprietary airfiber material. Resembling a bramble of interconnected strings of plastic, it’s firm, bouncy and supplies the structure with some excellent cooling. A quick assembly note: This bed requires a bit of set up, so won’t arrive compressed in a box like other mattresses on the market. Instead, you’ll receive three identical slabs of the airfiber material, which you’ll lay side-by-side on the frame to form a single 8.5” layer. Once you’ve done this, you’ll zip it up in the removable cover. For more on this, check out my setup video of the airweave. But enough talk! Let’s dive into this mattress. Cover – Crafted out of 100% polyester, the cover is light and stretchy, serving to buffer the sleeper from the somewhat uncomfortable coils of the airfiber material below it. I should add that it’s also totally removable, so you can throw it in the wash with the rest of your bedding. The Core – As I mentioned above, the core of the bed is built with the brand’s airfiber material, which is truly unlike anything I’ve ever seen. Constructed with an interwoven design, the large air pockets between the coils encourage a tremendous amount of airflow throughout the structure, making for a cool sleeping experience. While you might think that this space would make for a soft feel, the interlock construction actually produces some very firm support. And in case you’re concerned about the fibers poking you in your sleep, know that there’s a protective pad that goes over this layer to keep things nice and smooth. After taking a look at the construction of the airweave, let’s chat about the firmness and feel. I started off by applying light hand pressure to the mattress and was immediately interacting with the soft cover, which provided a pleasant, quilted hand feel. Pushing in further, I quickly encountered the buoyant airfiber material, which lifted me up and out of the structure. At this point I’d like to acknowledge that people of different shapes and sizes are going to feel firmness differently. So instead of only giving you my opinion on the overall firmness level of the airweave, I enlisted three other people to share their thoughts as well, which I then compiled on the graph below. 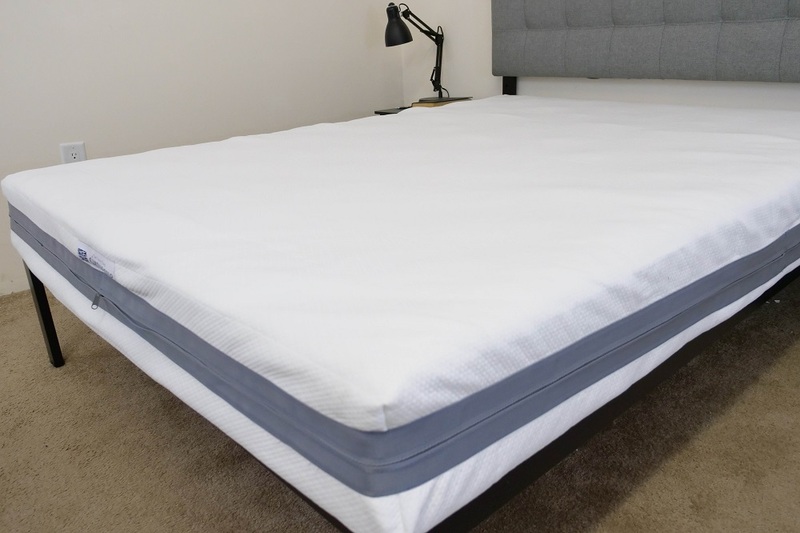 While feel is always going to be a personal thing, this will hopefully give you an idea of the firmness range you can expect from the mattress. 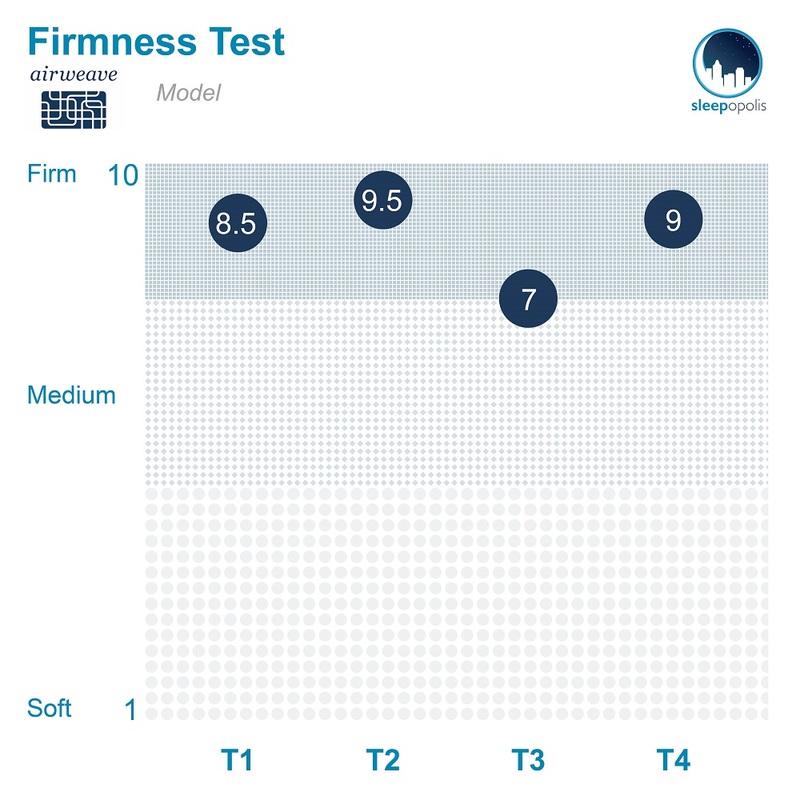 Though there was a bit of discrepancy among my testers, we ended up giving the airweave an average firmness rating of 8.5. When compared to the industry standard of 6.5 for medium firmness, it’s clear that this bed is quite firm. I personally gave the airweave an 8.5 as I found its airfiber core to feature a ton of firm support. However, I feel like it’s worth noting that this high rating doesn’t necessarily mean that you’re going to feel as though you’re sleeping on a cement slab. While I wouldn’t say that the bed offers a great deal of contouring, the airfiber material does in fact respond to the body with a bit of give. As you can see in the wide range of firmnesses on the graph, every sleeper is going to respond to this give in different ways. 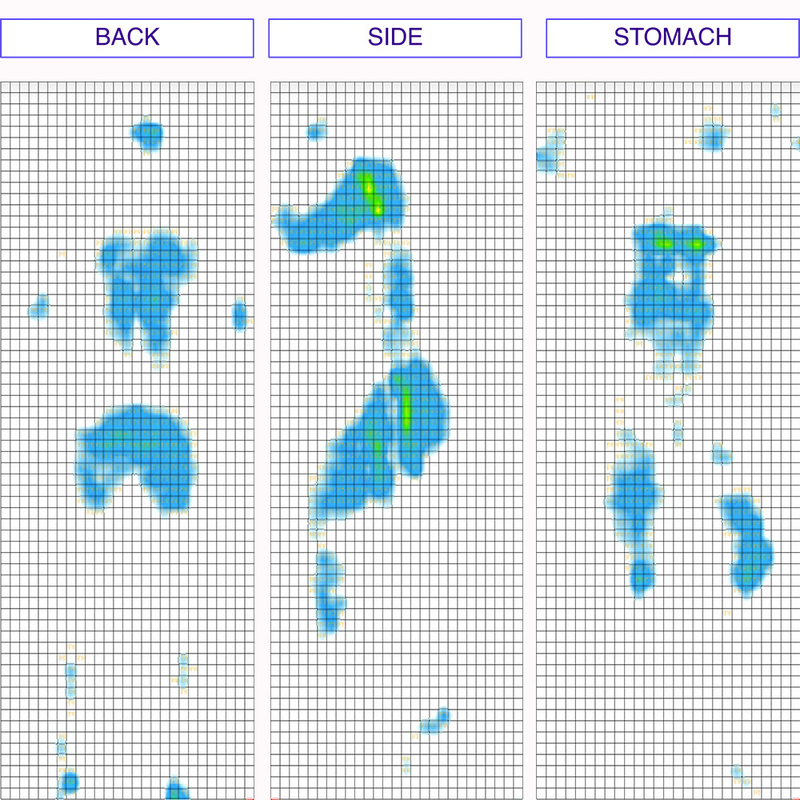 Another important component of feel is, of course, pressure, and more specifically where pressure points are likely to form while lying on top of a bed. Rather than merely telling you where these tension spots might crop up, I thought I’d give you a visual representation instead. To do this, I placed a pressure map on top of the mattress and lied on my back, side, and stomach. You can see the results on the image below where pressure is represented from blue (low pressure) to red (high pressure). Back – Lying on my back, my weight was evenly distributed across the surface. I didn’t really sink into the mattress at all, which helped to keep my spine in an even alignment for some nice pressure relief. Since I definitely felt situated on top of the mattress as opposed to in it, I found it easy to change positions. Side – As you can see in the graphic above, once i rolled onto my side I began to feel some pressure forming at my shoulders and hips. 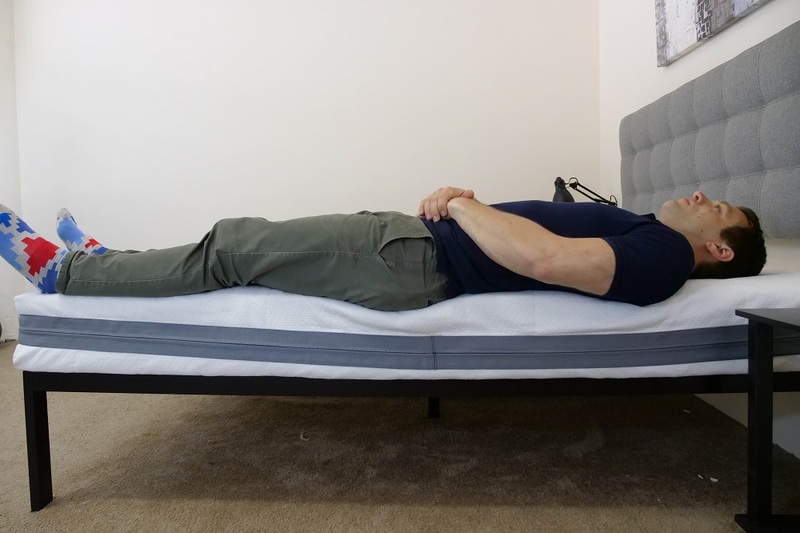 Since side sleepers tend to prefer softer mattresses, which target these typical problem areas with cushiony relief, I’m not super surprised by these results. Stomach – On the other hand, stomach sleepers usually opt for firmer beds, which prevent their hips from sinking too far into the structure. Given that this is one of the firmest mattresses I’ve tested, it did an excellent job at alleviating pressure in this position. That being said, I’d highly recommend the airweave for stomach sleepers. If you plan on sharing your bed with a partner, you’ll want to know what it’ll feel like when the other person crawls out of bed in the morning or tosses around at night. This next test is intended to test just that by assessing the overall motion transfer of the airweave. To illustrate this, I dropped a 10 lb. steel ball from heights of 4 inches, 8 inches and 12 inches and measured the disturbance it caused: the bigger the lines, the bigger the disturbance. As I mentioned up top, the airweave is a very bouncy bed, so I’m honestly a bit surprised by these impressive motion transfer results! 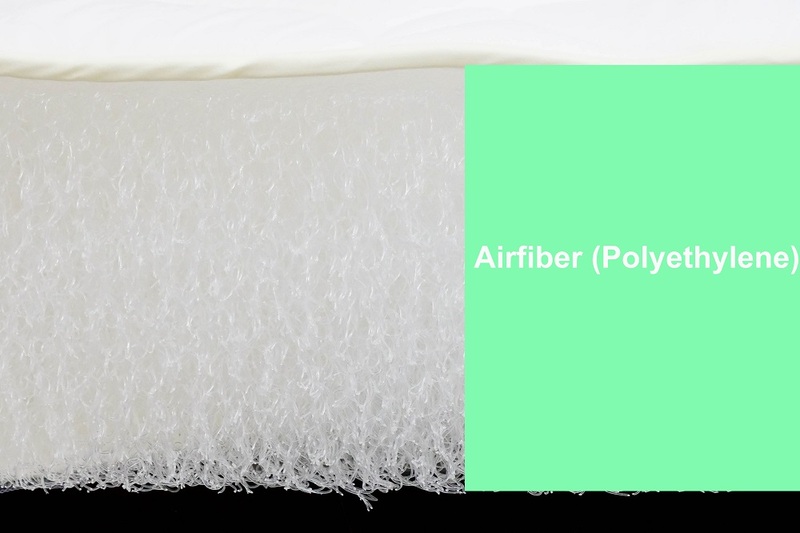 While the airfiber core has a quick response to pressure, the spaces between the plastic filaments allow the material to isolate motion well. Based on this, I’d say the airweave would make a fantastic bed for couples. When buying a new bed, you’ll also probably want to know whether you’re going to feel like you’re sinking “into” the mattress or lying “on top” of it. 10 lb steel ball: 1.25 inches of sinkage. 50 lb medicine ball: 2.5 inches of sinkage. 100 lb medicine ball: 4 inches of sinkage. Across the board, this is the least sinkage of any mattress I’ve ever tested. 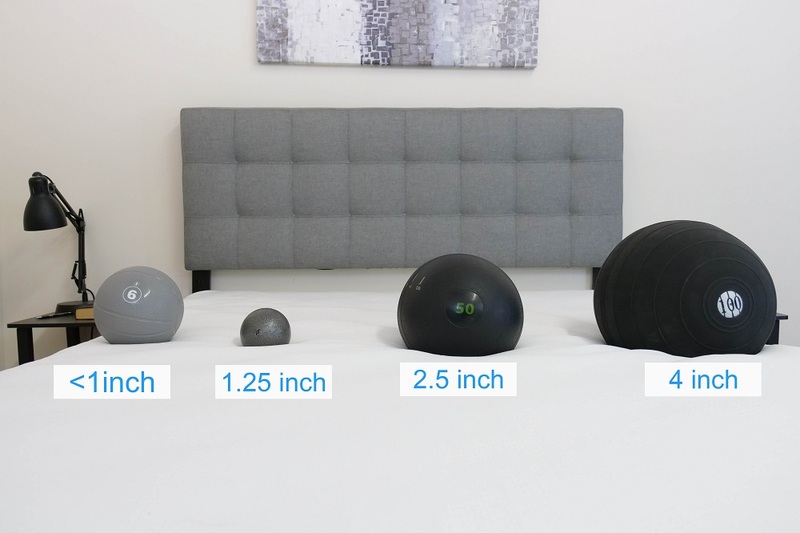 While this was initially pretty surprising, once I considered the bed’s firmness and bounce, it made sense. What this tells me is that you’re definitely going to be positioned on top of the mattress as opposed to in it and won’t experience very much body contouring. Lying on my back near the side of the airweave, I felt pretty incredible support. I didn’t notice any compression through the airfiber material, which means the feel was even all the way from the center to the edge. Rolling onto my side, I continued to feel secure at the edge. Even with the increased weight concentration at my shoulders and hips, the bed remained super solid. In this position, I wanted to simulate what it would feel like to be sitting on the bed in the morning when you’re lacing up your shoes and getting ready for the day. A lot of mattresses experience severe compression in this position, but the airweave actually held up amazingly well. In my opinion, the edge support on this bed is very strong! Shipping: Free, some assembly required. White glove service is available upon request. If you’re convinced the airweave is the right mattress for you, the size and pricing information for the mattress are below. 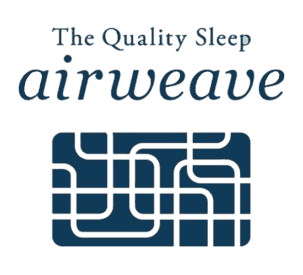 IS THE AIRWEAVE MATTRESS RIGHT FOR YOU? 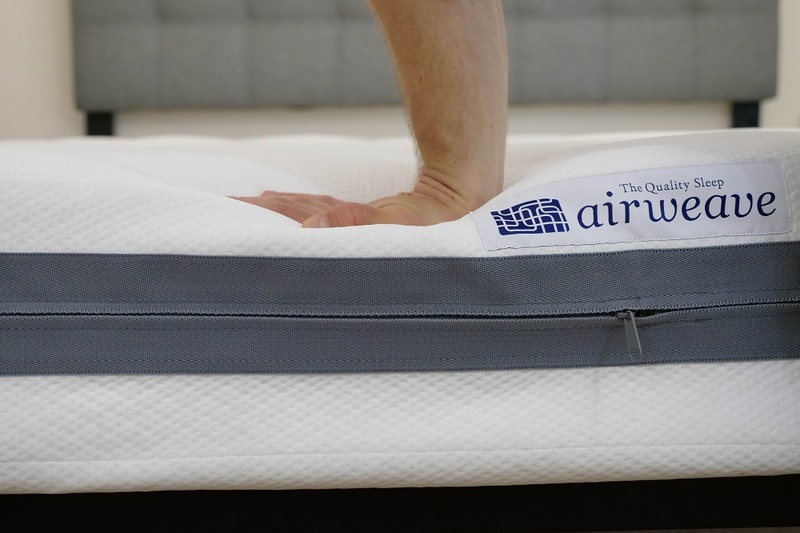 Anyone who wants a firm feel – As I discussed throughout this review, the airweave is one firm mattress! This makes it a solid pick for anyone in need of some firm support, particularly stomach sleepers. Need to sleep cool – The airweave is also fantastic at regulating temperature, so would be a nice choice for those of you who tend to overheat at night. Couples – With its amazing motion transfer and edge support results, I’d say the airweave would make an awesome option for couples. For more information on the airweave, check it out here! The Airweave mattress is quite a unique product. Built from thousands of interwoven airfibers, the Airweave mattress does not contain foam or coils. 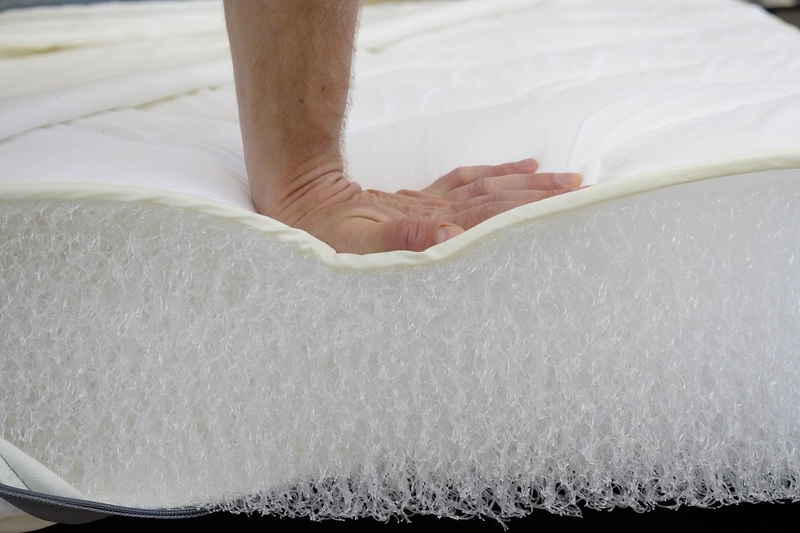 This mattress is strictly built from the airfiber core. A very firm feel is combined with good support, fast response, and a great degree of cooling. 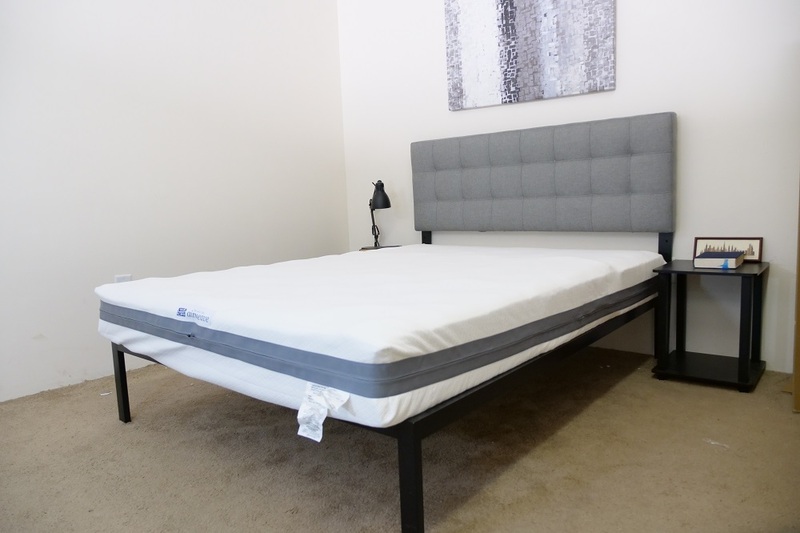 All things considered, I would recommend checking out the Airweave mattress if you’re in the market for an ultra firm mattress that offers more of a floating feeling, as compared to the more traditional level of sinkage and hug.